In the late 90s Red Bull kicked down the fence on the Austrian farm where it had been scientifically-engineered and rampaged across the globe, creating in its wake a multi-billion dollar “energy drink” business that has left sodas with names like Coca-Cola, Pepsi and 7-Up looking like hapless old fuddy-duddies. In today’s world these once eminent soft drinks are now regarded as a kind of home remedy to give to grandpa and grandma when the old folks start complaining about their digestion. What many people don’t realize, however, is that if Red Bull and the like could be said to have a grandfather, it would be a heavily-caffeinated soda released in 1985 by the tiny American beverage company Wet Planet. That product was called Jolt Cola. For a while, I was actually afraid to drink this stuff. Cocaine, ecstasy and Black Beauties I was fine with. Jolt Cola—hmmm, that could be dangerous! I blame this trepidation on the power of the media, who couldn’t write the horror stories fast enough: Jolt-binging college students collapsing dead in their study carrels as their overworked hearts came apart like sopping wet piñatas; pre-teens who’d guzzled the stuff steering their BMX bikes head-on into oncoming cement mixers after falling victim to angel dust-like hallucinations; ghetto youths wilding through suburban shopping plazas in search of Jolt Cola six-packs they had no intention of paying for. 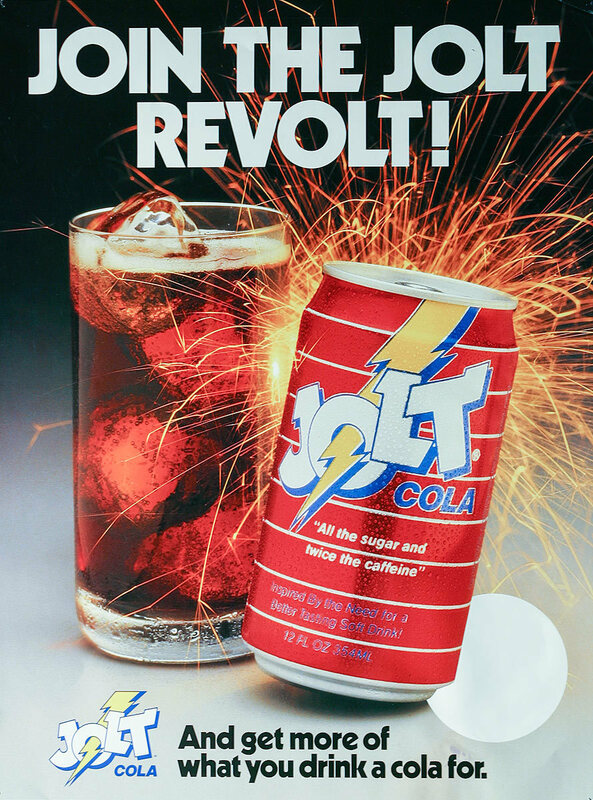 When I finally did take a few tentative sips I wasn’t much of a fan (my favorite cult sodas—Crystal Pepsi and Josta Cola—are both children of the 90s) but Jolt had a memorable run. It featured heavily in the popular culture of the time, often mentioned as the drink of choice for computer hackers, and I’m also pretty sure it was the primary medicine used by Dr. Oliver Sacks in the movie Awakenings to help bring those narcoleptics or whatever they were back to life. So you see, there is good and bad in everything! ← To Live And Die In L.A.